‘He was a fantastic supporter of the club,’ manager Shane Ronayne said of Ted Linehan. 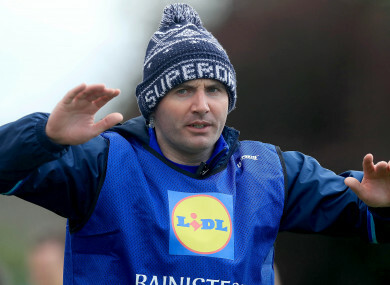 Mourneabbey manager Shane Ronayne guided Tipperary to All-Ireland glory this year. SHANE RONAYNE SAYS that his Cork and Munster champions Mourneabbey will carry huge sadness into Saturday’s All-Ireland ladies senior football club semi-final clash with Dublin outfit Foxrock-Cabinteely. Mourneabbey native Ted Linehan, who tragically drowned last weekend, was a regular attendee at club matches, and watched on with pride when Ronayne’s charges won another provincial title recently. Mr Linehan was well-known in Cahir as an active member of the local Tidy Towns movement, and he was also a former PRO of the local GAA club there. Mr Linehan’s remains reposed at Costigan’s Funeral Home in Cahir last evening (Tuesday), and following today’s funeral mass at Michael’s Church, Annalentha, Mourneabbey, he was laid to rest in Burnfort Cemetery. Ronayne, a teacher at Coláiste Dún Iascaigh in Cahir, said: “Ted would have been in Dublin on Saturday and our thoughts are with his wife, Mary, his son Fergus, and daughters Edel and Emily. “He was a fantastic supporter of the club and was at every Mourneabbey game. Mourneabbey will hope to honour Mr Linehan’s memory in the best possible fashion by booking their place in another All-Ireland final. And opponents Foxrock-Cabinteely are not unfamiliar to Ronayne, who worked with the club in the mid-noughties. Ronayne, who guided Tipperary to TG4 All-Ireland intermediate glory in September, explained: “I was teaching in Dublin and one of the girls living in the house was playing with Foxrock-Cabinteely, and there was another girl training with them. “That was in 2005 and Philip McAnenly, who was the manager at the time, asked me to get involved, training them. “It was the first year as an adult club and Pat Ring, the current manager, was a selector with them. “Sinead Goldrick (Dublin All-Ireland winner) was 14 or 15 at the time, Amy Ring was playing, Ciara Murphy from Dublin was involved. “Pat was very good to me, and I used to go up during the summer to train them and for matches. Fox-Cab contested last year’s All-Ireland final, when they lost out to Donaghmoyne, but Ronayne believes that the Dublin and Leinster representatives will have learned from that experience. He said: “I watched that final and I don’t think they performed to what they were capable of. “They were very good in the semi-final (against Carnacon) and maybe the day got to them. “I was in contact with Amy and Pat afterwards, and they felt they didn’t turn up. “I’d know a good few of their players – Niamh Collins and Sinead Goldrick are powerhouses, Amy Ring is excellent up front and they have Fiona Claffey from Westmeath, Laura Nerney from Laois, and Ciara Murphy, who I saw play a good bit with UCD, an excellent player from Kerry. “They’re a seasoned outfit and very similar to ourselves, having come through the ranks. Email “Cork kingpins hope to honour late supporter by booking All-Ireland final spot”. Feedback on “Cork kingpins hope to honour late supporter by booking All-Ireland final spot”.